The Particle Effect panel in the Scene View contains some additional options for previewing Particle Systems. Simulate Layers Allows you to preview Particle Systems that are not selected. 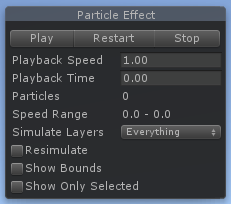 By default, only selected Particle Systems play in the Scene View. However, when you set Simulate Layers to anything other than Nothing, effects that match the Layer Mask play automatically, without you needing to select them. This is particularly useful for previewing environmental effects. 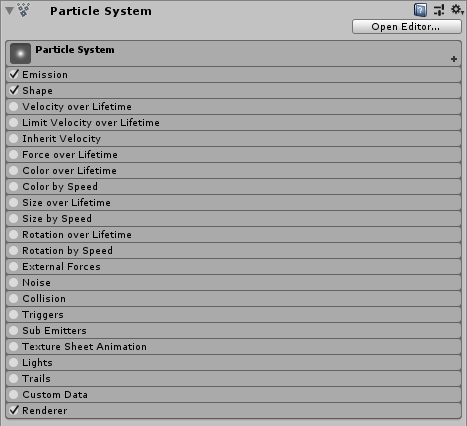 Show Bounds When this property is enabled, Unity displays the bounding volume around the selected Particle Systems. These bounds determine whether a Particle System is currently on screen or not.